Hi! I hope you are enjoying the block of the month so far. 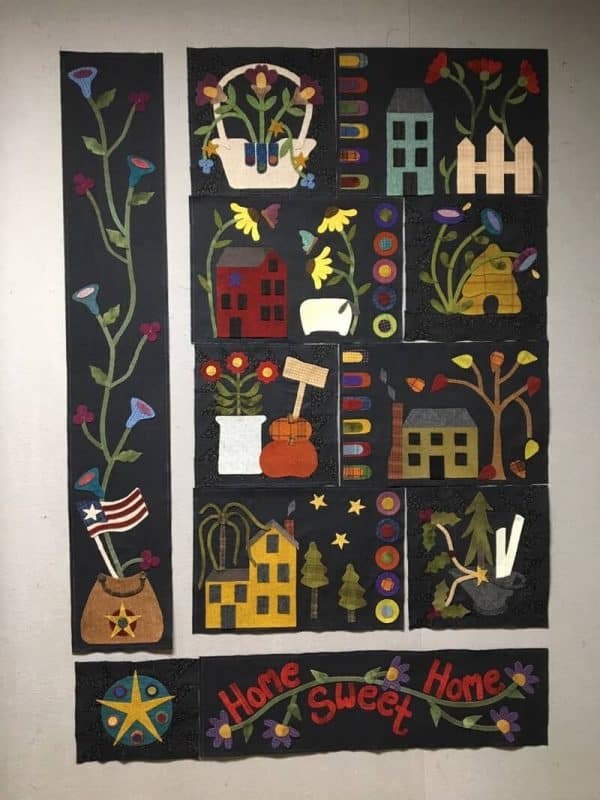 This next installment is the bottom of the wall hanging and contains one of my favorite sentiments: “home sweet home”. There will be a limited amount of kits available for this block. 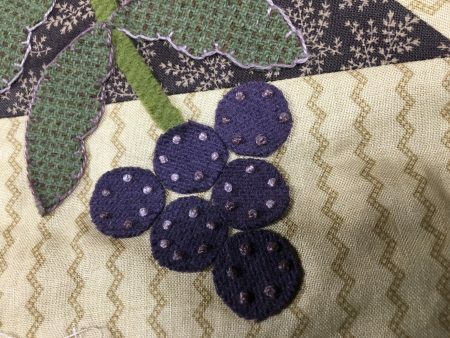 Those kits will only contain the wool needed to make the block, you will provide your own backing fabric. I am on the road so the kits will be made available later this week in my shop and I will announce it via e-mail. So now’s the time to sign up for my newsletter alerts! (see sidebar for signup). Some kits for blocks 2 and 3 are still available while supplies last. When I get some more wool in, the previous months may become available again. Keep watch for my e-mails! Have you finished block 1 of the 2019 BOM? Yes, you say? Well, here is block 2 for you to work on this weekend! 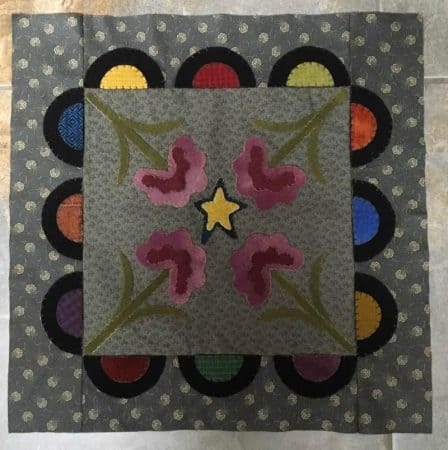 For a link to the pattern, go to my Block of the Month page. 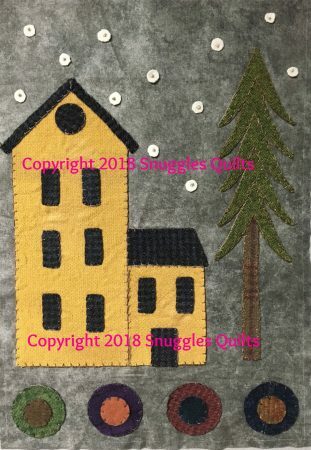 And when you have finished downloading the pattern (or patterns if you have not started the 2019 project yet) you can refresh your wool applique skills with my Wool Applique Tips and Techniques blog post and also my stitching tutorials on YouTube: Stitching Points and Interior Angles and Wool Applique Stitching. 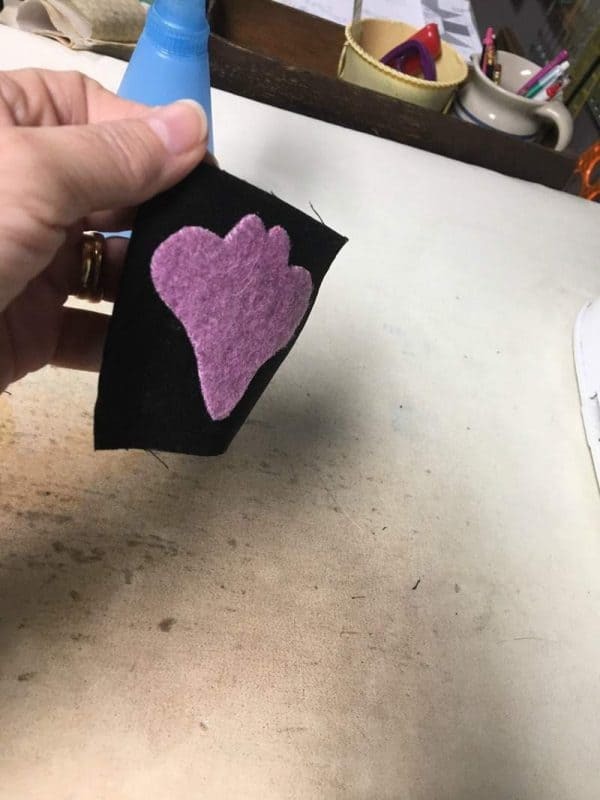 When I did my last wool applique stitching tutorial, I received a request to demonstrate how I stitch points and interior angles. So, here is that tutorial. Hope it’s helpful! As promised in my blog post from Monday, here is the stitching tutorial for wool applique. 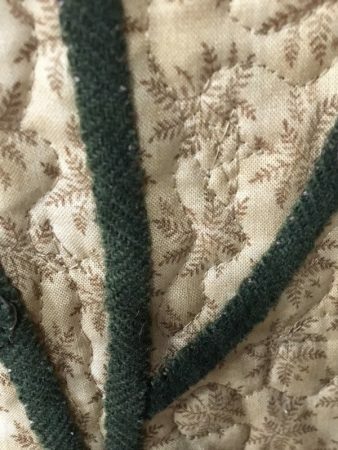 This is how I teach the blanket stitch and the whip stitch, two of the stitched I use the most when working on a wool project. 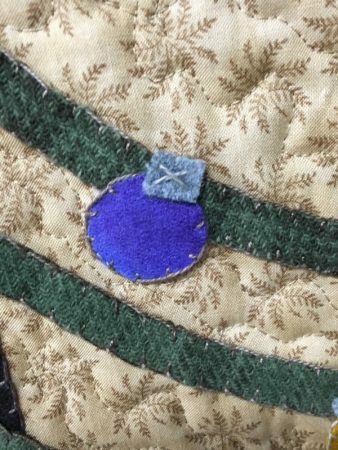 Enjoy the video and start stitching! 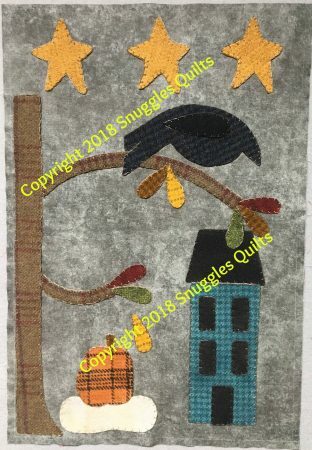 If you missed my announcement on January 15th, I released the first block in my 2019 BOM wool applique project! For more information on this block and the free pattern, go to my Block of the Month page. 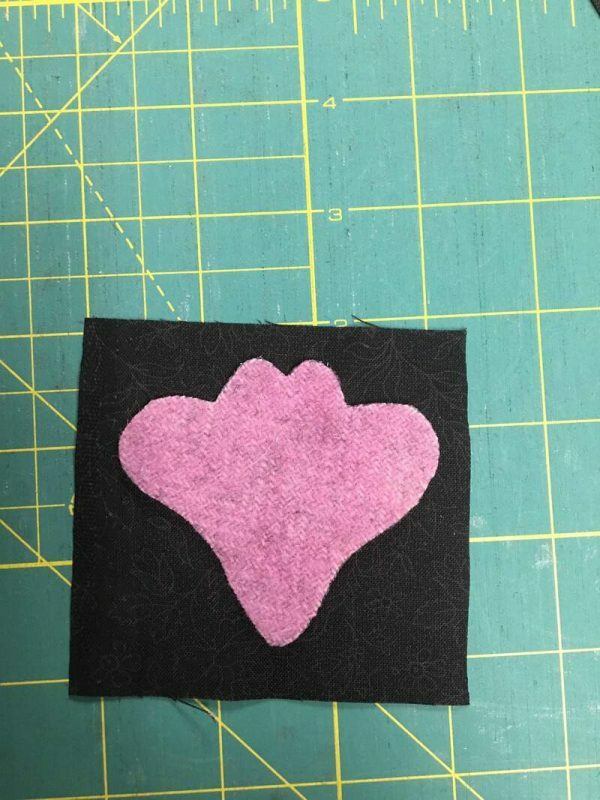 So, if you want to join in on the fun, but do not know anything about wool applique, I’m going to give you some tips and techniques here. First of all, my wool applique projects are stitched on 100% cotton backgrounds. Sometimes they are pieced backgrounds like the block above or sometimes just a plain background will do. 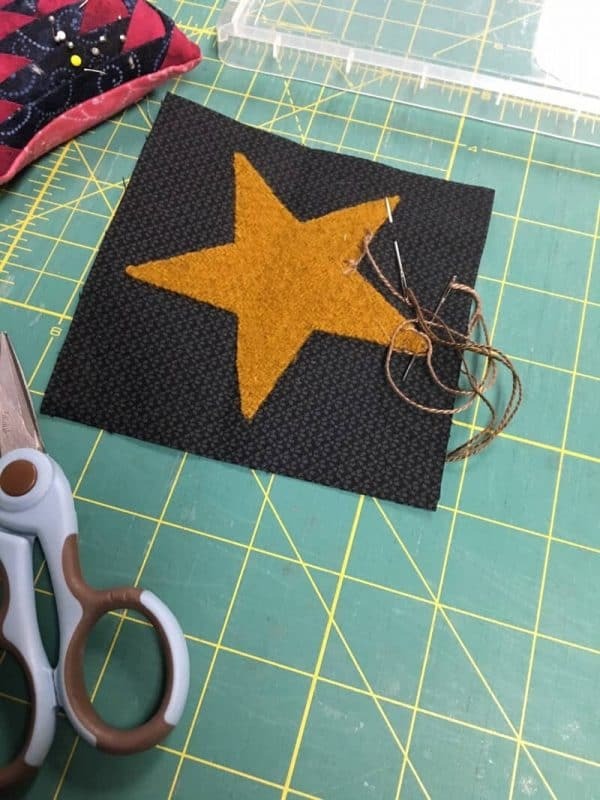 In my BOM project patterns, if there is a pieced background needed, the instructions are included in the pattern. Step 1: Once I have my background block, I like to reinforce the edges with Fray Check to keep the block from fraying from all the handling while stitching. Step 2: Templates. 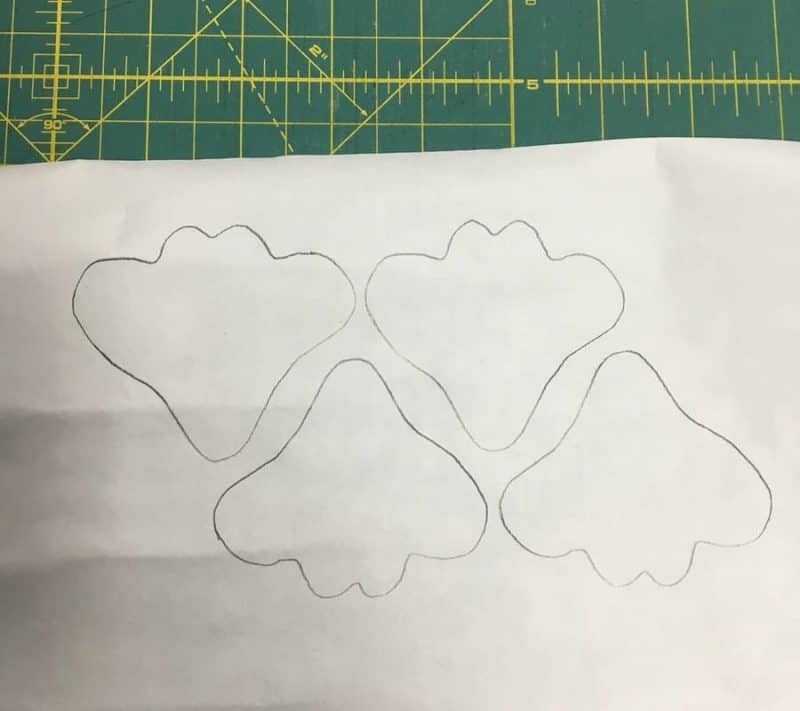 In my patterns, the templates are included. I like to reinforce them by gluing the page with the templates onto a piece of cardstock or thin cardboard. Then I cut out each template. Reinforcing them allows you to re-use the over several times. It also keeps your shapes from distorting as you trace around them. 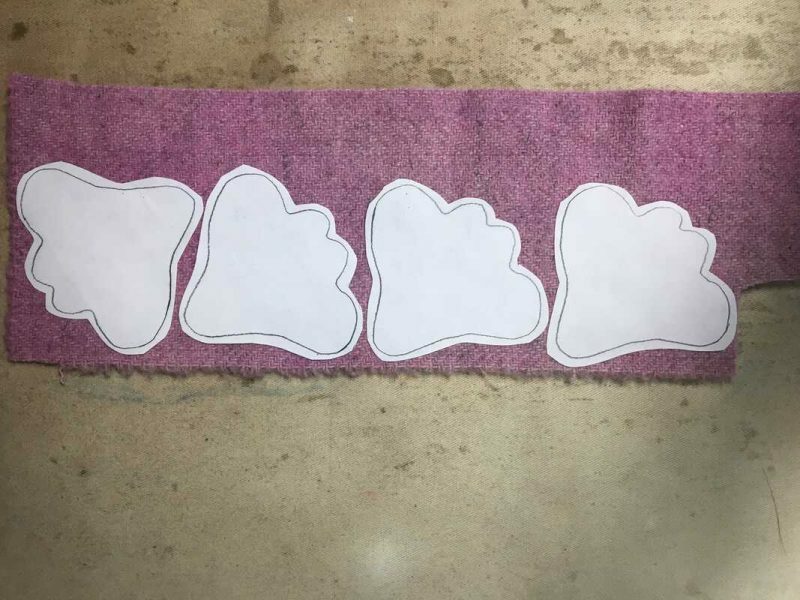 Once you have your templates ready, it’s time to trace them onto fusible web. I use Heat’n Bond Featherlite, but you can use your preferred brand. 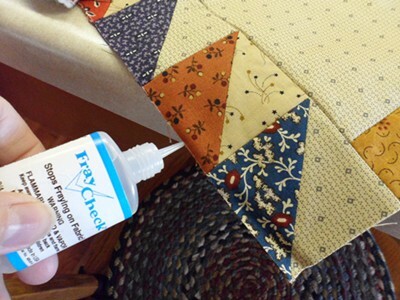 Check with your local quilt shop on what they like to use. 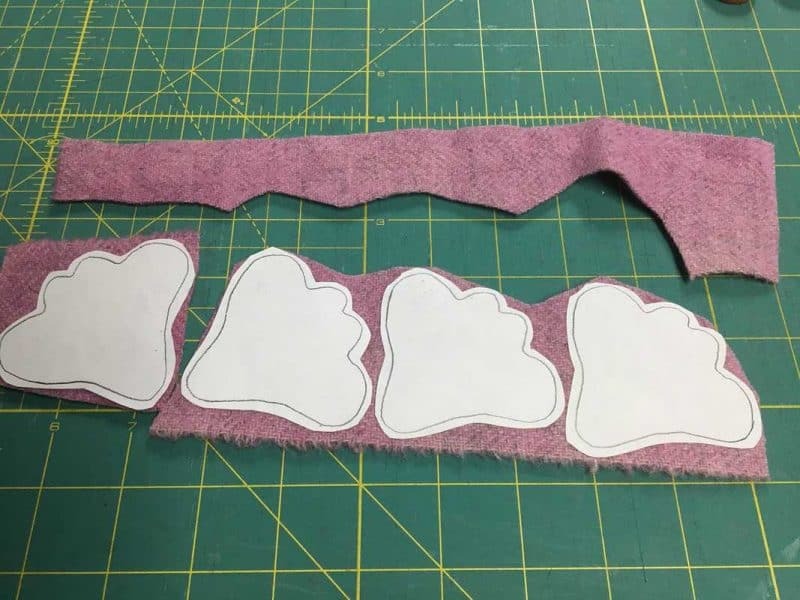 Using a pencil, trace the shapes needed onto the paper side of the fusible web. 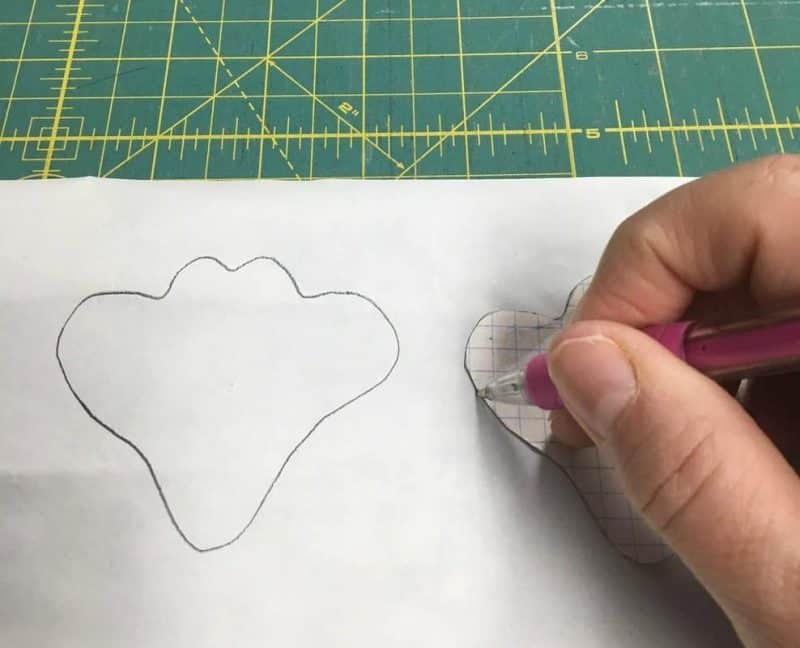 Leave enough space between your tracings for cutting out the shapes. You’ll want to cut out the shapes outside the lines. My templates are ready to trace but all patterns may not be the same. 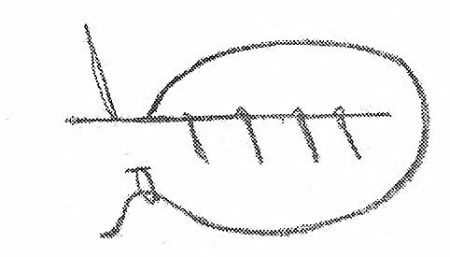 If there is a motif that needs to face a particular way, you will have to trace the template reversed. 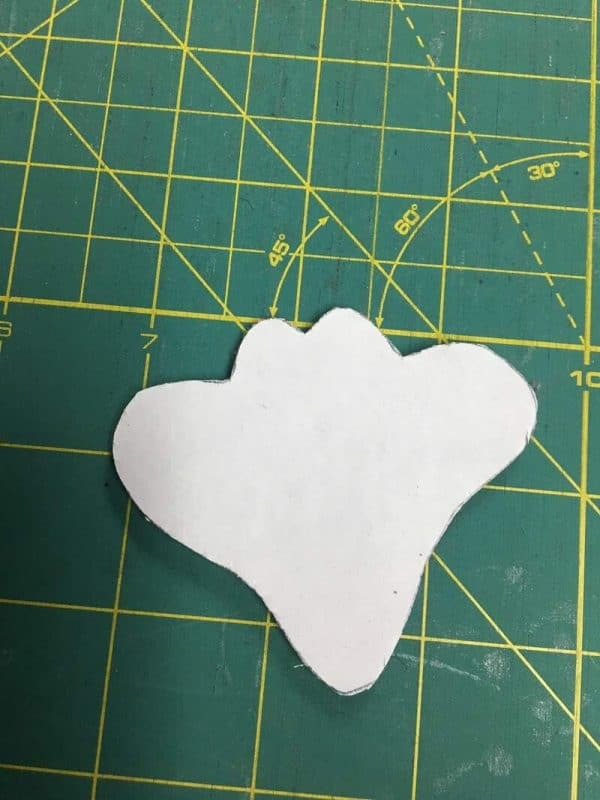 For example, if you have a jug with a handle that faces to the right on the project, you need to trace the template for the jug with the handle facing to the left. Step 3: Time to fuse the fusible web shape to the chosen wool. 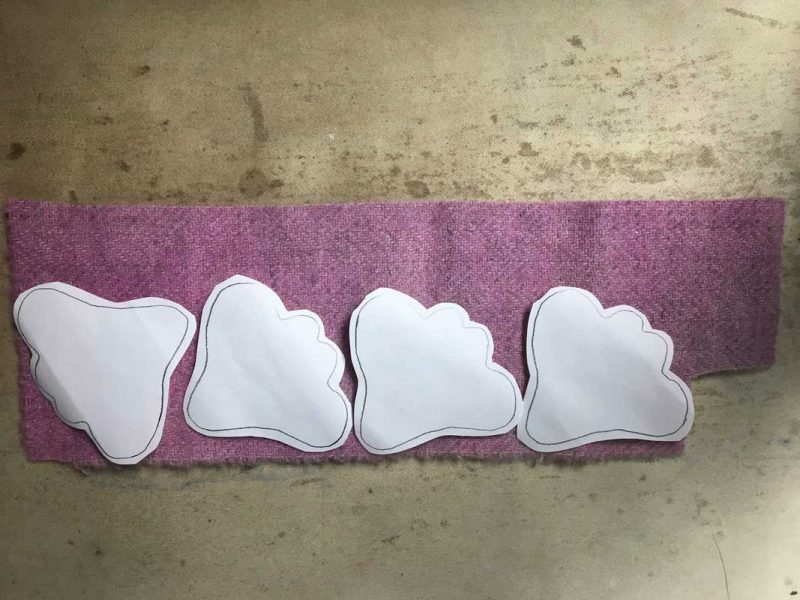 Since wool is expensive, you need to position your pieces on the wool to close together as shown, leaving room to cut out the pieces. 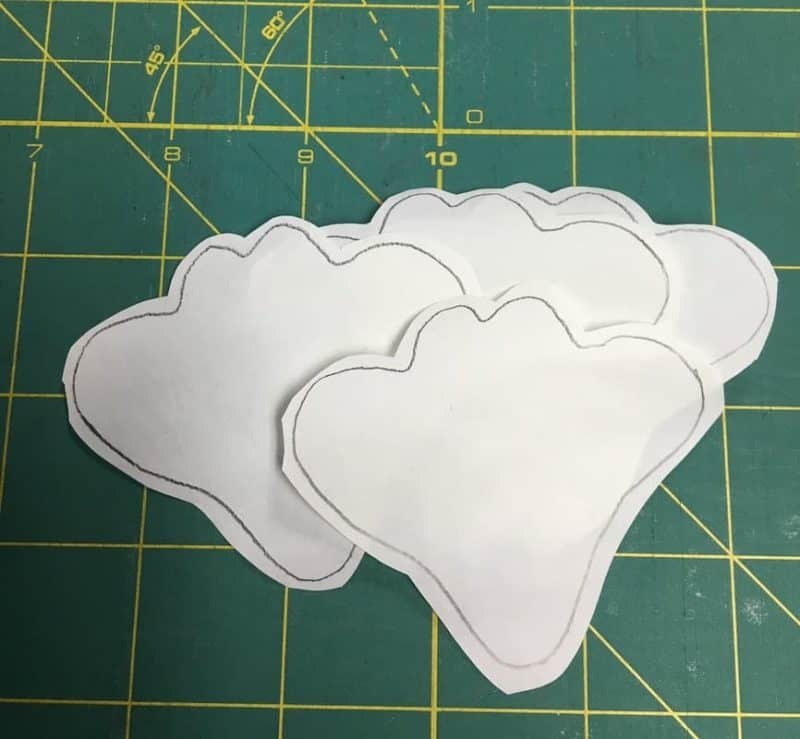 Make sure to place the fusible shape with the paper side up. 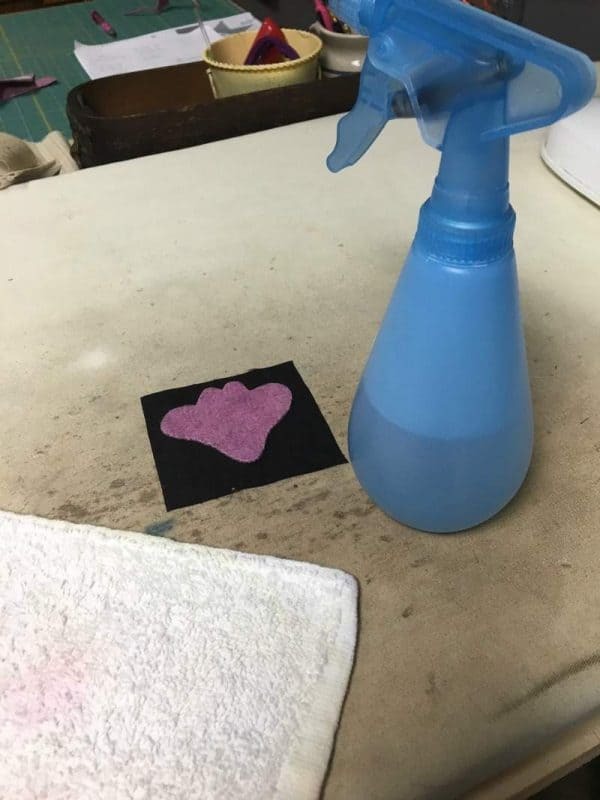 Follow the manufacturer’s instructions for the type of fusible you purchased for iron temperature, etc. Now when you cut out the units, the top part of the wool can be saved for a future project. 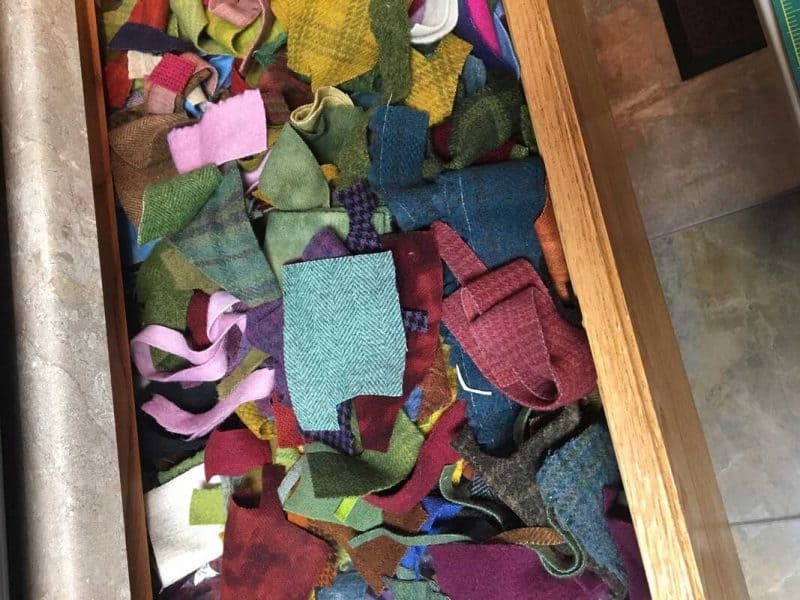 Believe me… I keep all my scraps! You never know when you’ll need them. Step 4: Now it’s time to fuse the wool shape to the background. 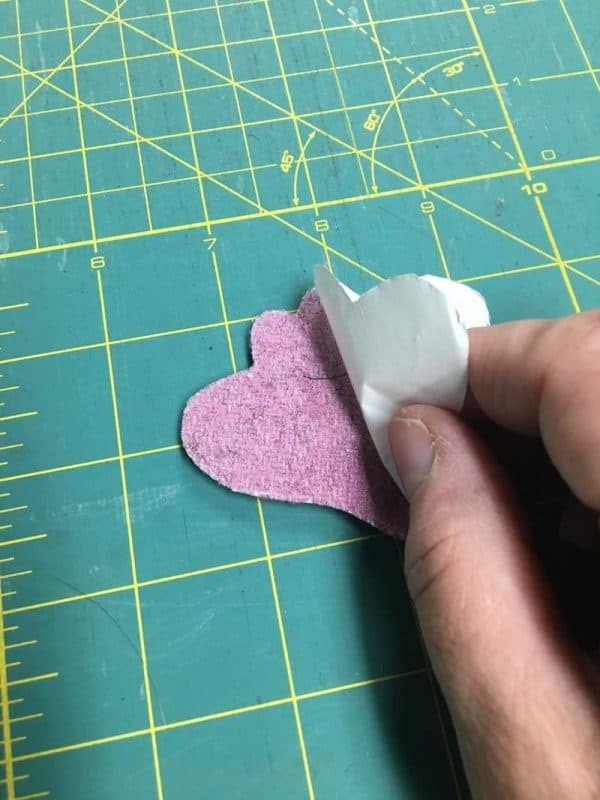 Peel the paper backing off the shape and there will be a shiny surface left on the wool piece. Place the shiny side down on the background fabric. 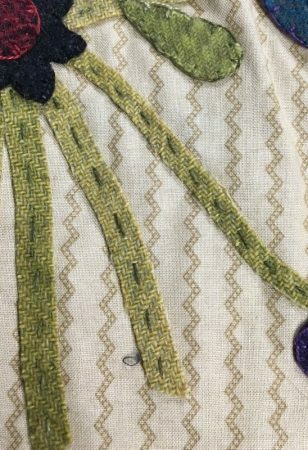 I like to use a white towel dampened with water to cover the wool motif, then I press to fuse the piece to the background. The steam from the damp towel helps to fuse the wool to the background. 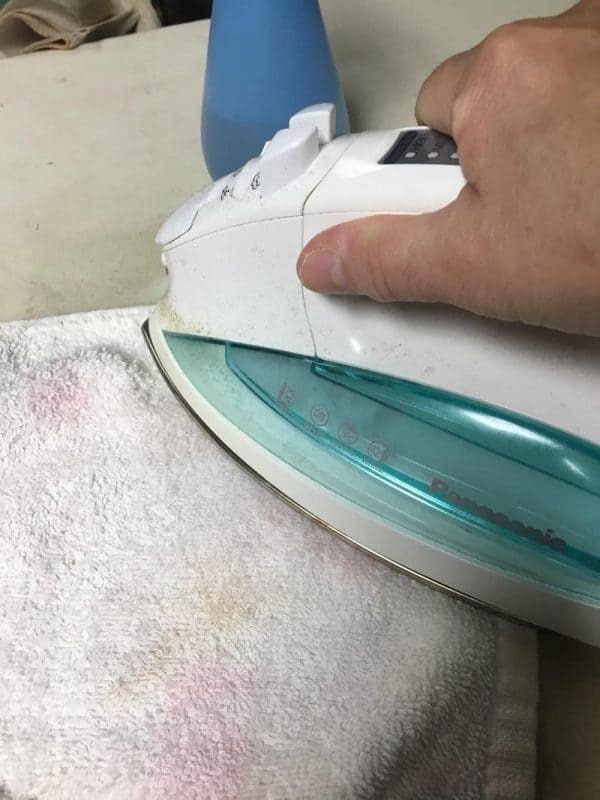 Also, the towel protects the wool pieces from the iron. Now you’re ready to stitch! 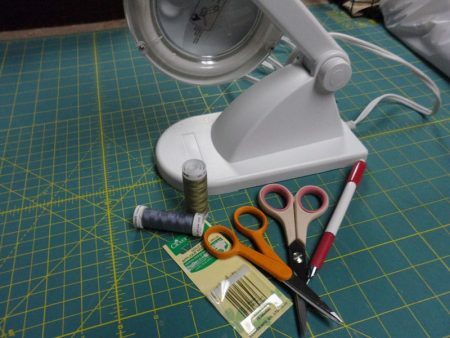 Come back later this week for a stitching mini tutorial. It will be a short video demonstrating how to do the blanket stitch which is the most common stitch used. Until then, enjoy getting ready for the stitching! Happy 2019! I hope your holiday season was a good one and that you are ready for some fun stitching in 2019. 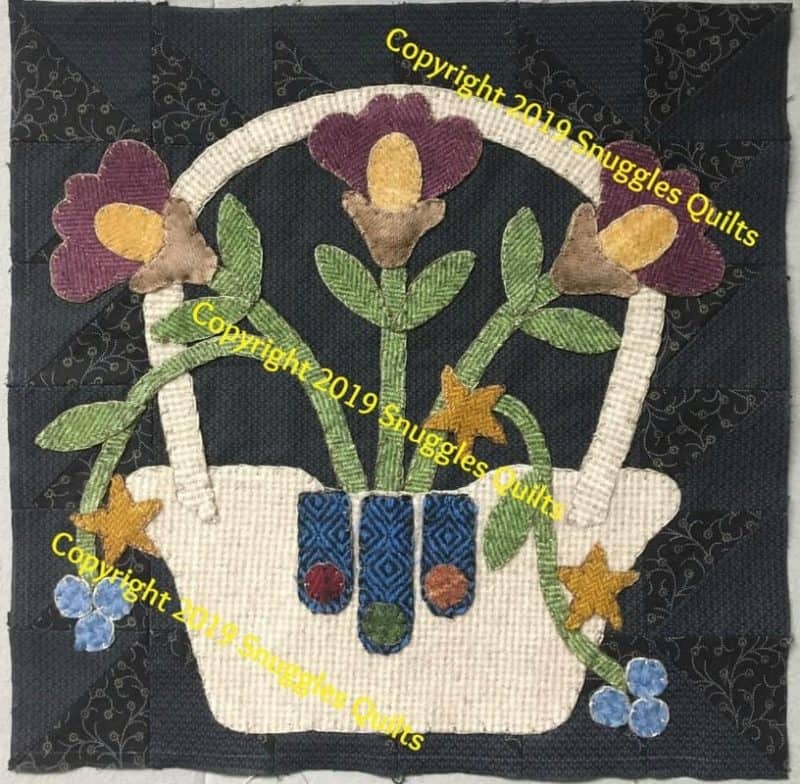 But before we get to the starting instructions for the 2019 BOM, I want to remind you that when I post the first block for 2019, the free 2018 block patterns will no longer be available. You will have until January 14th to download those for free. 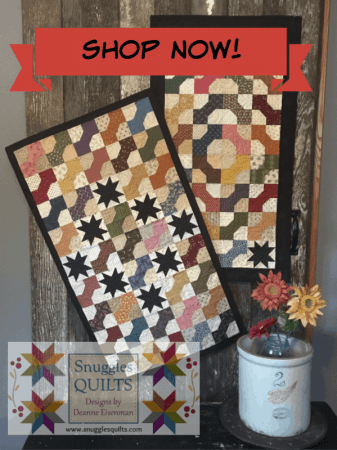 I also posted a few new quilting tutorials the last 2 weeks. I want to share them here in case you did not see them on Instagram or Facebook. So click on the link above to get started! Once you have gathered your supplies and prepared the blocks, come back for block number on on January 15th! 2018 BOM – Time to Finish! 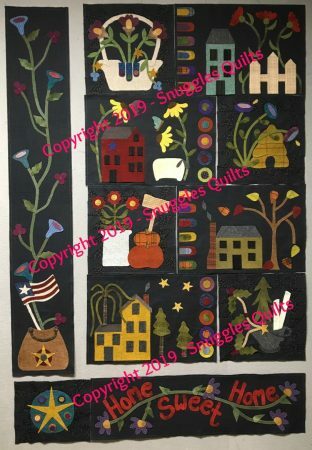 For the instructions for the block border and for the wall hanging layout, go to my Block of the Month page. I hope you enjoyed this journey with me. Make sure you collect all the block patterns if you need to catch up. Once I start posting information on the 2019 BOM, the 2018 BOM blocks will no longer be available for free. The patterns will be for sale as a .pdf download at the end of January in my Craftsy Store. I will keep you updated for when that happens. So, for now, get your instructions and enjoy finishing up this year’s BOM! See you in 2019. 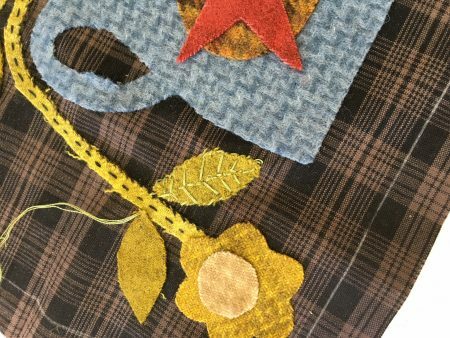 Fun with Stitches on Your Wool Applique! 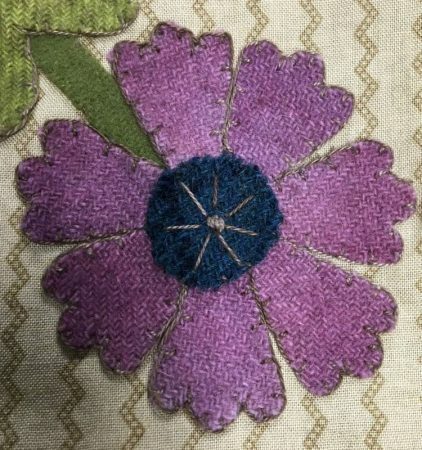 I was teaching a wool applique class on Saturday and I thoroughly enjoyed seeing how each student interpreted my project. From using a different background fabric to adding a bird to a flower pot, it was fun! 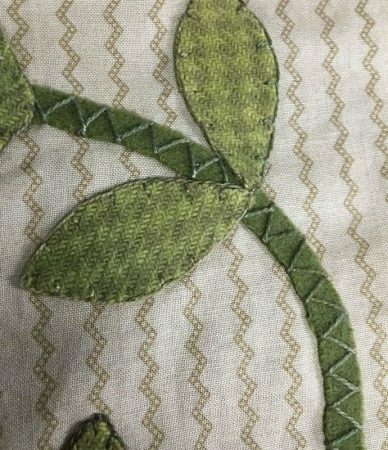 I also showed students different stitches they could use to secure the appliques motifs. I instantly thought …. blog post! I wanted to share some of the fun stitches that can be done in addition to the usual blanket and whip stitches. Those are great stitches! But, now for some fun! 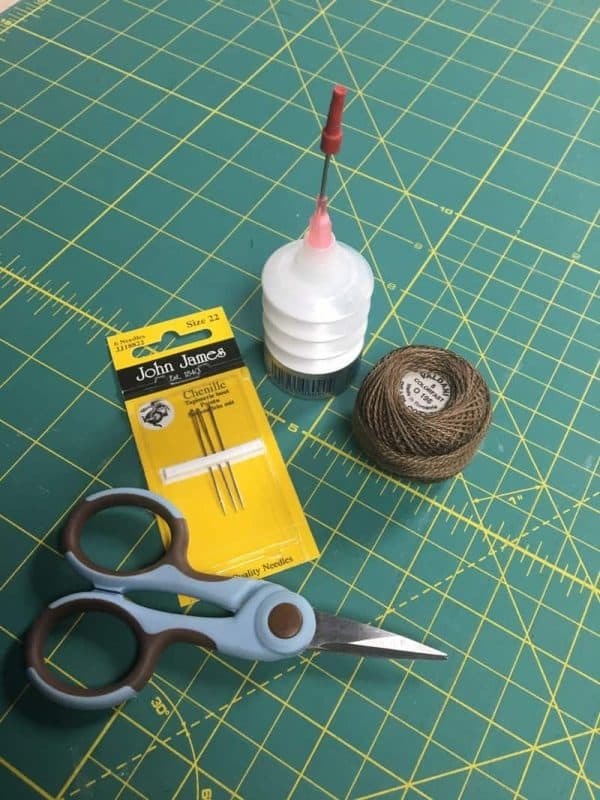 Here are a few fun options for stitching on stems. 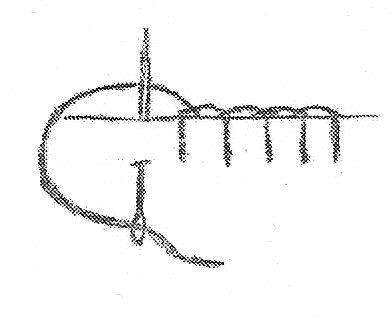 This next stitch is just a running stitch up the middle of the stem. or, just do several French knots to secure them! 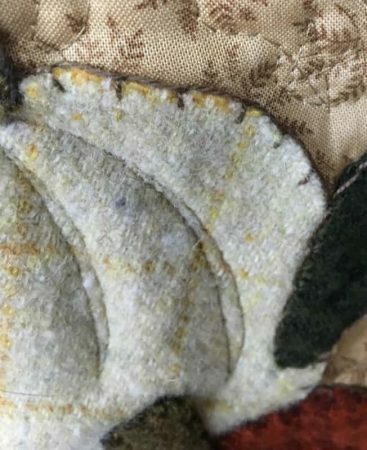 So I hope this display of stitches inspired you for your next wool applique project. 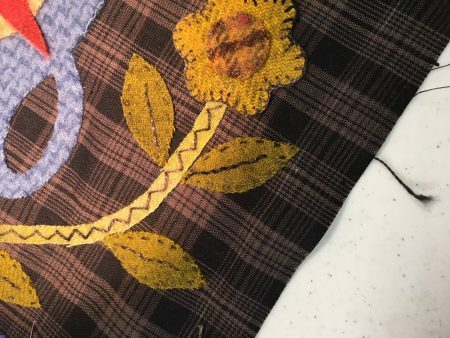 Have fun and experiment with new ways to stitch pieces on to background. If it doesn’t look good to you, it can always be changed. All it costs is a little time. New Block of the Month Block! Block 9 is Here! It’s mid-September so it’s now time to reveal Block 9 of my 2018 BOM. Yes, there’s snowfall in this block….hopefully we won’t get snow yet though. Enjoy stitching this block and get ready for month 10. Month 10 and 11 will be a bit different as they are the top and bottom long panels. We’re nearing the end of this fun project! Month 12 will be putting it all together and adding some fun wool applique embellishments to the sashings. 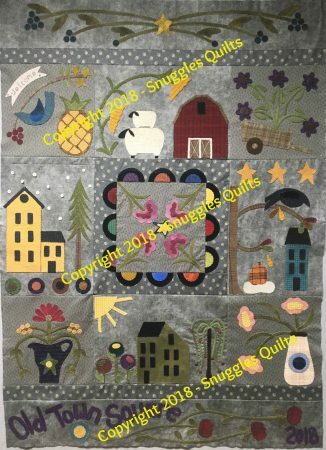 2018 Block of the Month – Block 8! 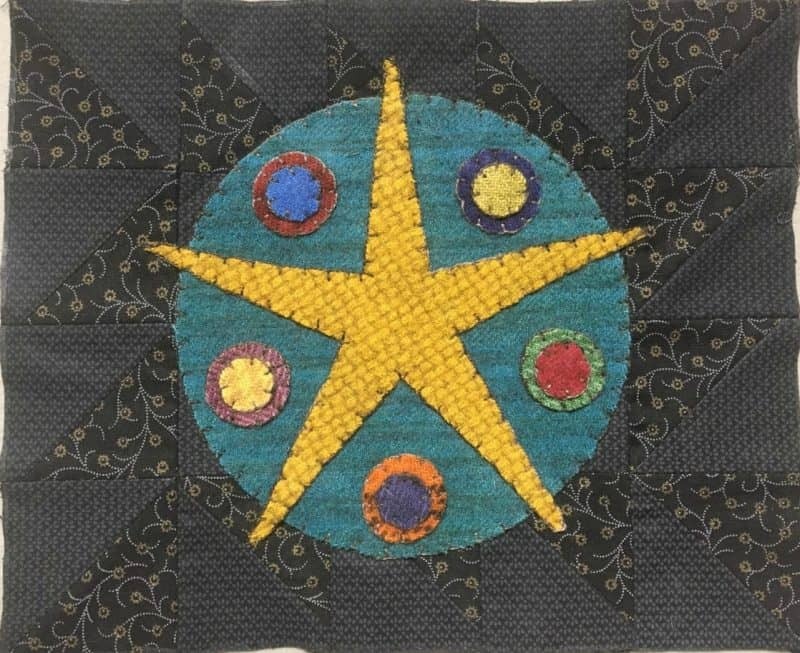 If you are just joining in on my BOM, you can find links to the beginning instructions and the other 7 blocks on my Block of the Month page.